DONATE. This is the hard part – you need to send a check. (No online Donate button.) I know you can do it! While you’re going to all that paper-based trouble :-), write a bigger number! Yep – Ricker even said “People have to think about a thing for several centuries”! For those healthcare audiences I say “But it can be done!” and point to the now-famous 45 vintage sexist ads that wouldn’t go down well today. We sure changed that culture. The change isn’t complete but it sure has moved. Even more on point, I often cite this delightful flyer from Ricker’s era saying “Vote no on woman suffrage,” with some marvelous reasoning. 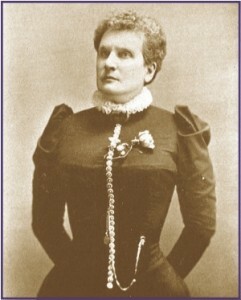 Ricker was the first woman who tried to vote in New Hampshire (demanding a ballot as a property owner and competent adult, in Dover in 1870 and yearly thereafter). She was also the first female who applied to practice law in New Hampshire, having already been admitted to the Washington DC bar. When she was refused, simply for being a woman, she brought suit and won, thus opening the NH Bar to women in 1890. Reminds me of cancer widow Regina Holliday, creator of The Walking Gallery of Healthcare, who Forbes.com called Health Care’s Rosa Parks! Wouldn’t it be great if every state had a project like this, to recognize their own pioneer suffragists?? Social change starts with one person saying “This should not be,” then others saying “I too will not stand for this,” and then many pitching in – $50, $100, $25, $10. Thank you! “Any extra funds would be divided equally between the League of Women Voters NH and the NH Women‘s Bar Association, with an informal understanding that we each would use at least some of those funds to support the NHWomen’s Heritage Trail project, particularly the plaque to honor Marilla Ricker in Dover. I’m sure you’d like to read about that project.